1.1. SE2-3 has a combination of #2 = sickness with #7 = "theft or loss of wealth". Fortunately, #7 being a weak metal element can help to further weaken #2. 1.2. Good if the frontage has a water position. As this water position: such as a swimming pool, pond or even a water feature, can further reduce and neutralise #2 with #7. 1.3. In a block, if there are stacks facing SE2-3. 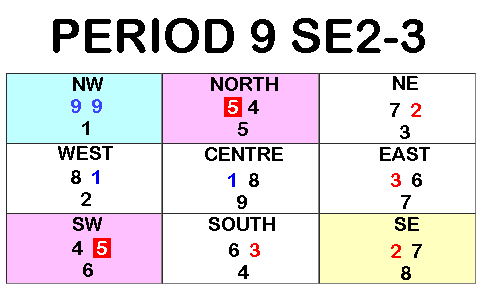 Usually, on the opposite site, there should be units facing NW2-3 respectively. 1.4. Other than a separate issue of daily afternoon sun at the frontage, one may consider studying a NW2-3 facing unit. 1.5. Given that a NW2-3 has the double auspicious current prosperity wealth luck at it's NW frontage. 1.6. BUT please read Para 2. below on the inauspicious "Fire-at-Heaven's Gate - if it is at NW!" 2.1 If the frontage is SE, then usually NW is the rear of the unit. Often either the Kitchen or service yard or air-con ledge is located at this sector. 2.2 Under Flying Star Feng Shui, here NW with the double auspicious #9's current prosperity wealth luck is "Wasted at the rear of the unit." 2.3. If the kitchen especially the stove is at NW, then this is inauspicious. Search for the inauspicous "NW & Fire @ Heaven's gate"
3.1. For a SE facing unit, usually either the living room or master bedroom is at East or South. 3.2. Since both sectors have equal set of Flying star numbers either  +  or vice versa, no issue if the master bedroom is locatd at East or South sector. 4.1 Centre-point has the auspicious Mountain Star #1. 4.2. Thus good even if there is open or clear space at the centre-point. 5.1. North has the other nasty #5 = misfortune sickness. Thus not ideal if it is a bedroom. Where possible, try to disarm this #5 whichever the sector it is in. 6.1. Try to balance these two sector since each have their respective unlucky Flying Stars. 7.1. West sector has another #1 or coming prosperity wealth star. Good if it is a bedroom, study or clear space.